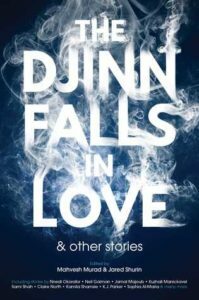 The Djinn Falls in Love is absolutely stunning. The stories are captivating and I absolutely loved the title. What a fantastic way to reflect the ways we fall in love with the djinn and visa versa. This collection is touching. I found out about this through an author and it allowed me to find so many other great authors. That is the best thing about anthologies. Above all, I am still so in love with this idea of the djinn embracing us. The book enfolds us in an embrace, taking us into the story itself. We are allowed to see into the world of the djinn. These stories are lyrical and they question this line we have between the authentic and the illusion. How do we manipulate this boundary ourselves? In this anthology, we see so many sides of the djinn and even humanity itself. Numerous stories are unhurried and spectacular. They are vivid and each establishes a sense of time and place that transports you. We see the djinn at their mysterious and at their most ordinary. I recommend this book for those who love these authors and even those who have never heard of them. Check The Djinn Falls in Love out on Goodreads. Is there something you’d want to see an anthology of that hasn’t been done before? Neil Gaiman’s writing definitely blurs boundaries between reality & illusion. I haven’t read any of the other authors so thanks Lili!